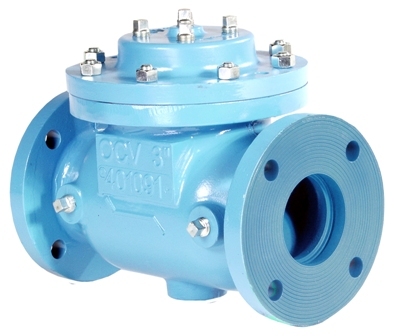 The OCV Basic Control Valve 65 Globe and 65 Angle is a full port engineered valve. When equipped with a variety of pilots and accessories the valve performs a wide range of automatic fluid control, making it a specified valve in municipal water, fire protection, irrigation, industrial, petroleum and aviation fueling systems. The 65 is dependable and hard working; with a simplicity of design that ensures minimal part wear for exceptional performance and longevity. Self-contained, the valve operates automatically off line pressure. The 65 consists of three major components: body, bonnet and diaphragm assembly. Heavy-duty, nylon-reinforced diaphragm isolates top chamber operating pressure from bottom chamber line pressure. Diaphragm replaced without removing internal stem assembly. 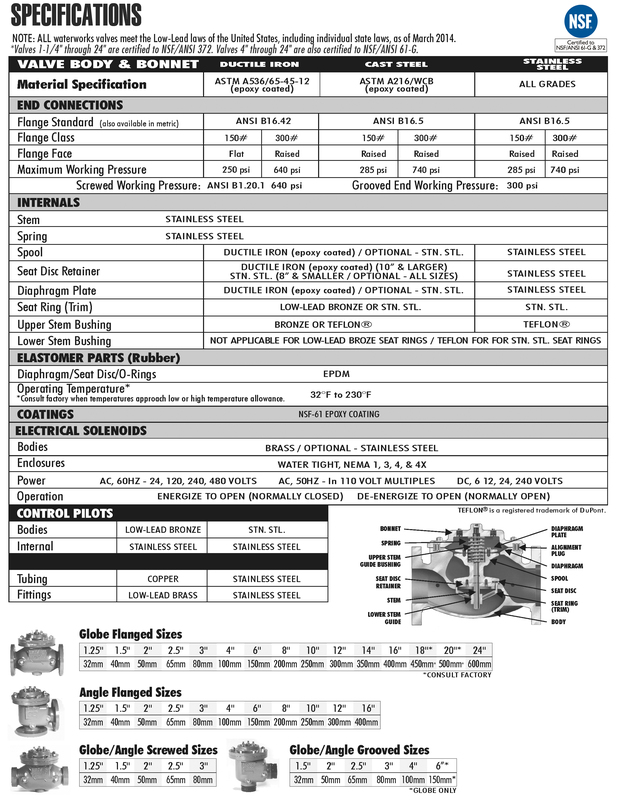 Center-tapped bonnet facilitates installation of position indicator or valve-actuated switches. Ductile iron and steel valves are epoxy- coated inside and out, for maximum corrosion protection. When line pressure from the valve inlet is applied to the cover chamber, pressuring the diaphragm, the valve is closed drip-tight. When diaphragm chamber pressure is vented the valve travels to the full open position. The valve is between full open and closed. The valve’s control pilot modulates the pressure in the diaphragm chamber, positioning the valve to control the desired pressure or flow. OCV pilot systems provide accurate control in a wide range of performance requirements. For maximum efficiency, the OCV control valve should be mounted in a piping system so that the valve bonnet (cover) is in the top position. Other positions are acceptable but may not allow the valve to function to its fullest and safest potential. In particular, please consult the factory before installing 8″ and larger valves, or any valves with a limit switch, in positions other than described. Space should be taken into consideration when mounting valves and their pilot systems. A routine inspection & maintenance program should be established and conducted yearly by a qualified technician. Consult our factory @ 1-888-628-8258 for parts and service. 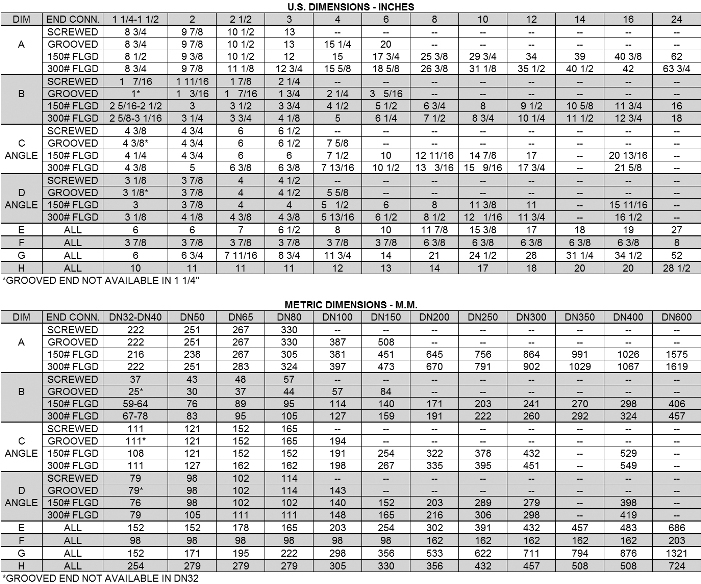 Series Number – Valve size – Globe or Angle – Pressure Class – Screwed, Flanged, Grooved – Trim Material – Adjustment Range – Pilot Options – Special needs / or installation requirements.